Insomniac Games: Behind the Scenes on Ratchet & Clank: All 4 One Insomniac Games, the development team behind the critically-acclaimed Ratchet & Clank and Resistance franchises, discuss their next Playstation 3 project, Ratchet & Clank: All 4 One. 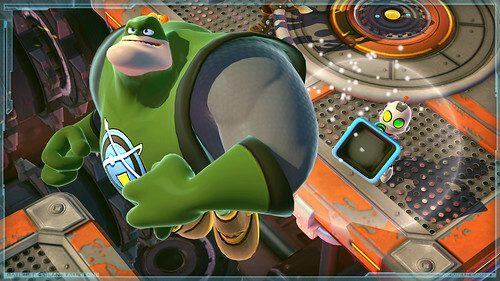 Attendees will be treated to the first official U.S. demo of Ratchet and Clank: All 4 One and will also have the opportunity to ask questions during a Q&A with Insomniac. G4TV’s Adam Sessler will be moderating a panel featuring Insomniac Games North Carolina Studio Director Chad Dezern, and Production Director Shaun McCabe. In addition, you can look forward to hearing Insomniac Games Senior Writer TJ Fixman’s wit and Jersey-accent, as he discusses not only All 4 One, but the upcoming comic series as well! One of gaming’s most beloved and long-time developer podcasts brings the show live to PAX Prime. Join host James Stevenson (Senior Community Manager, Insomniac Games) and key leaders from Insomniac Games as they record the next episode of the Full Moon Show. Also on tap will be a special mystery guest, and a new Behind the Scenes look at Insomniac Games. The live show will also feature a segment of “I Want Your Job!” as well as plenty of time for you to ask questions – and perhaps even win some rare swag! We are very much looking forward to seeing you in Seattle this weekend, so please make sure to drop by and say hello! Is this R&C title still running at 60FPS or have you pulled it back for extra glitter? Are any of these types of demos ever going to be brought to PS+ users? Hey James when will a demo be available on the PSN store for those of us that can’t make it to PAX. Thanks. will this game be 720p? I’m so glad to hear from you guys so often lately. I was a very cold, very dark time without you. Even the R3 billboards didn’t provide any warmth. Can’t wait to see what your new IP will be- sounds like we may be getting Insomniac x3 next year. Yeah, enjoy your current firmware, seeing as any future ones will undoubtedly turnn your PS3 into scrap, and given that you violated the EULA, you’ll only have yourself to blame (both morally and legally). I just wish you guys would let us in on Resistance 3. I at least want to know if you’re turning back to horror elements. Unfortunately, this game seems to revert from it’s old style to waaay too kid friendly loosing my interest. @jeigh spell my name right – u pillow biter – in no way do i support piracy . you talk about morals and legal? what happen to my Other OS ? i don’t forget i was robbed by sony. sony cant stop it . why do you think they’re going to court over the ps jailbreak ? cuz they cant stop it . this is just like the pandora battery for the old psp. you didn’t get robbed from sony removing other os..maybe read stuff instead of just clicking through it. Wow, so much epic coming from Insomniac at PAX this year. They should rename the show InsomniPAX! Man PAX seems to be getting bigger every year. I am so jealous of all the people that get to attend. Looks like I will have to mark it on the calendar for next year and make a vacation out of it. @Jeigh, please do us, the PSBlog, and the gaming industry all a favour and chug 3 boxes of advil then slit your wrist. Then we can get on with our lives and not have to read your off topic BS spam that nobody wants or needs to read. me and my 4 yr old son are really gonna enjoy the coop. He loves the ratchet series almost as much as he likes motorstorm. Game looks great! Can’t wait! yay a game i can play with my friends, will there be competitive mode? because that matter to me! PLEASE post a demo for psn, or if you need to create incentive then psn+ but make sure to eventually post it on regular psn too (i have psn+ myself but it still should be available for regular psn members as well.). I know a lot of ps3 gamers would love to play the demo!